If I’m making a list of my top 10 favourite films, there’s one that always nabs an appearance and when mentioned, is received with a bit of shock. For some reason, amongst the company of The Godfather and Apocalypse Now, Steven Spielberg’s War of the Worlds doesn’t really appear to be a natural fit. But in my mind, it’s one of his best. Great effects, a solid script, a moving performance from Tom Cruise and an absolutely batshit crazy cameo from the one and only Tim Robbins. Do you ever wonder how you’d handle a situation like what’s presented in War of the Worlds? Would you be able to keep your cool in the face of aliens landing and pretty much destroying everything in their path. Now, don’t tell me you haven’t thought about it, at least once or twice. Thought, what would I do, to keep myself or my family safe. 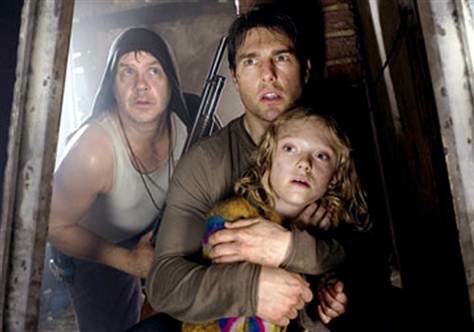 In War of the Worlds, Tom Cruise’s ambivalent father, Ray Ferrier, keeps moving with his children while he watches his world and ours come crumbling down. It’s rare to see Cruise play the everyman, but in War of the Worlds he does it and believably so. He let’s his fear show, let’s tears fall from his eyes. I’ve always thought it’s one of his best performances, lost and forgotten because of his media shenanigans leading up to the film’s release. While Cruise’s character fights for his insanity while facing insurmountable odds (and aliens), it’s Tim Robbins role that solidifies War of the Worlds’ place in our March Madness feature. As Harlan Ogilvy, he offers shelter to Ferrier and his daughter Rachel (Dakota Fanning). Ogilvy’s family was killed when the aliens began their invasion and he’s determined to get revenge. But Ferrier doesn’t like the look in Ogilvy’s eye, especially when he looks at his daughter. Whatever’s left of the characters sanity goes when he sees humans harvested for red fertilizer. At this point, Cruise’s character realizes he’s stuck with a madman. Tim Robbins is maybe on screen for six or seven minutes, but he makes those moments count. For a few seconds you think, this guy’s ok. He’s going to help them out. And then you quickly realize there’s no help coming from Harlan Ogilvy. For some, these scenes bring the movie to a bit of standstill, but for me, I think Robbins’ role is core to seeing how another character would look to survive during the invasion. War of the Worlds is science fiction, but it’s also horror, with Cruise and Robbins essaying two very drastic methods of survival – one is movement, the other madness.